DGH is broadly bestowed with the responsibility of managing the various activities with regard to Indian E&P acreages. They are in terms of awarding exploration blocks, executing production sharing contracts, monitoring developed fields etc. India has an estimated sedimentary area of 3.14 million square kilometers, comprising 26 sedimentary basins. Petroleum Exploration Licenses (PEL) for conventional domestic exploration & production of crude Oil and natural gas were granted under four different regimes over a period time. Till the end of 1970s, Indian E&P industry was dominated by the two National Oil Companies (NOCs) - ONGC and Oil to whom PELs were granted on nomination basis. Exploration was primarily confined to onland and shallow offshore. 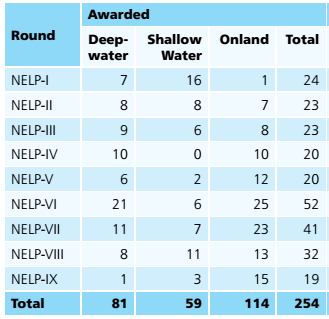 Under NELP, blocks were awarded to Indian, private and foreign companies through International Competitive Bidding process where NOCs viz. ONGC and Oil are also competing on equal footing. The Government has taken number of measures to bring in healthy competition and public participation by the way of NELP for exploration & production of Oil & gas in the country. NELP has not only accelerated the quest for hydrocarbon exploration, but has also brought the state of the art technology and efficiency of operations /management to the country.